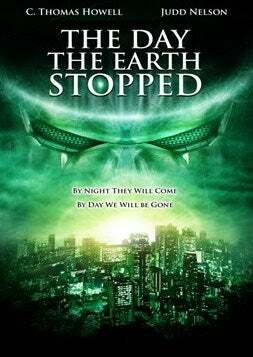 Screw "Day the Earth Stood Still" and Watch This! I went to Sunset Pacific Studios in downtown LA where The Asylum Productions were filming The Day the Earth Stopped (homage to/remake of The Day the Earth Stood Still). This movie is directed by and starring C. Thomas Howell (Pony-boy Curtis himself)! The supporting cast includes the legendary Judd Nelson. I was playing a soldier/SWAT officer in a sci-fi, futuristic film… [that] involved 4 car chases and in one of them I was the driver! That's correct… I was chasing a car being driven by C. Thomas Howell, and one of his passengers was Judd Nelson! It is all so crazy! Then later in the day, under the close personal direction of C.T. Howell, I did an intimate scene with Judd Nelson where I pointed the barrel of a rifle (M-16) at his face (just inches away). Guns and car chases and the stars of The Breakfast Club and The Outsiders. 3 days ago I didn't know a thing about this project and now it's over. Doesn't that sound twenty times better than Keanu Reeves as Klaatu? I mean you've got the same cheesy teen actor flavor, but with improv actors shooting Judd Nelson! And Pony-boy Curtis directing! Plus, let us not forget: The Day the Earth Stopped contains MORE THAN ONE GIANT ROBOT. Keanu's silly movie will only contain one. Even if it is Gort, it's still only one, compared to probably like a million. C. Thomas Howell's masterpiece hits the DVD racks in early December, and I'll be there to snap one up. I love the fact that this ripoff flick actually sounds more original than the movie it's ripping off. The Day the Earth Stopped [via Asylum] Thanks, Kaiju Ultra-Sensei Avery!